We are the official guides for the Forest of Dean and lower Wye Valley. We offer coach tour commentaries, guided walks and talks. Our guides come from a variety of different backgrounds and occupations but we all live locally in the Forest of Dean or the Wye Valley and all have a passion for the area and a desire to share this with visitors. We have all completed a recognised course on guiding covering coach tours and leading walks in both town and the countryside. The courses concentrated on the Forest of Dean and the Wye Valley and all guides are approved by the Forest of Dean District Council. We lead country walks that can vary with the seasons; daffodils and bluebells or autumn colours. Walks can be along the riverbanks, woodlands or rolling pastures. Many walks are on disused rail tracks and these can be quite gentle. There are also more arduous walks along steep valleys. In all these cases, the tours can be tailored to your specific interests, eg churches, castles, local food and drink, industrial heritage, rivers, wildlife etc. Your guide will give you an entertaining and informative tour that tells you something of the folklore, history, architecture, nature and the people of this special area between the Severn and Wye on the border of England and Wales. 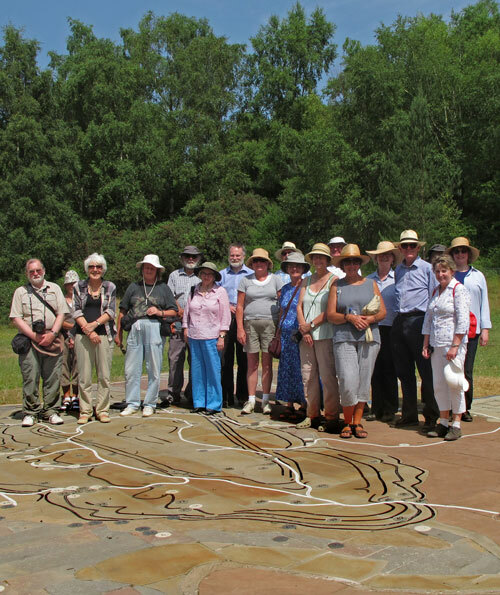 A group of walkers from Bath Archaeological Society at a unique feature – the Forest of Dean Geomap. This was part of an all day visit organised by our guides.